Geox Kids Shoes for Boys and Girls, a wide range of footwear for school, parties and more. Free UK Delivery. 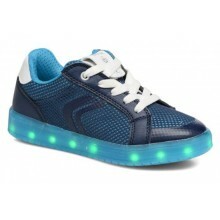 Geox kids shoes have become very popular in the UK as well as around the world. The combination of excellent fitting, breathable soles, durable construction and sought after styling, has made them the first choice for many, when looking for new school shoes or trainers. 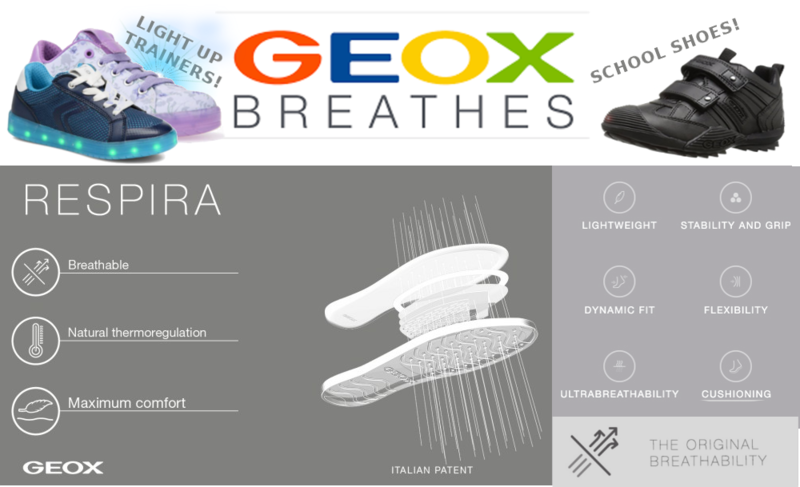 Geox are famous for their pioneering breathable soles. Perforations in the sole allow the hot air to escape from the shoe. This is particularly useful for children - who as every parent knows - run about a lot and would otherwise have very hot wet feet, leading to discomfort and smelly shoes! Even though they allow air to get out, the soles don't let water through - a patented technology provides a membrane which allows air through but keeps the water out. So their feet should be nice and dry in spite of the odd puddle! All Geox children's shoes are designed to be easily fitted - and except for the very young. your child should be able to take their own shoes on or off without worrying about complex zips or laces. Towards the end of Summer many parents are in search of new shoes for their growing children. Geox are particularly popular - with the Geox Savage for boys and the Geox Shadow proving popular amongst the girls. (see images on the right for examples of some of our Geox Kids Shoes). Order today for Free UK delivery and remember our price pledge promise means if you can find the same shoes cheaper elsewhere we'll beat them by 5% - details here. For help with picking the right size consult our children's fitting advice or contact us.